Unlike sashimi, which is almost always eaten with chopsticks, nigirizushi is traditionally eaten with the fingers, even in formal settings. While it is commonly served on a small platter with a side dish for dipping, sushi can also be served in a bento, a box with small compartments that hold the various dishes of the meal. Soy sauce is the usual condiment, and sushi is normally served with a small sauce dish, or a compartment in the bento. Traditional etiquette suggests that the sushi is turned over so that only the topping is dipped; this is because the soy sauce is for flavoring the topping, not the rice, and because the rice would absorb too much soy sauce and would fall apart. If it is difficult to turn the sushi upside-down then one can baste the sushi in soy sauce using gari (sliced ginger) as a brush. Toppings which have their own sauce (such as eel) should not be eaten with soy sauce. 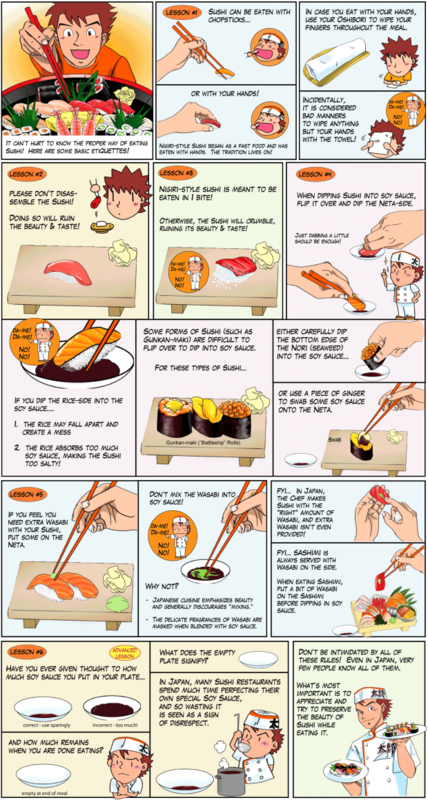 In practice, many people—particularly Westerners, both in Japan and abroad—ignore the traditional sushi eating methods. It is common to see diners mixing large amounts of wasabi into their soy dish and dunking the rice straight into it. Further, not all sushi is created the same; traditional nigirizushi is made so that the entire piece can be consumed in one bite, and etiquette considers this the correct way to eat it. However, some chefs may include too much rice or too much topping, making it difficult for some people to fit an entire piece in their mouth, so that two bites or more must be taken. If you want to look like a pro next time you eat sushi, push aside the utensils and pick up the chopsticks. 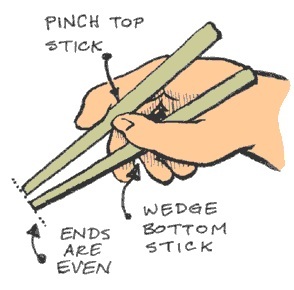 Here are simple steps to learn how to use chopsticks for your next meal. 2. Pick up a chopstick and hold it so that it’s resting comfortably between the tip of your fourth finger (the ring finger) and the hollow gap between your thumb and index finger. Keep the fourth finger straight. This will be the bottom chopstick. 3. Now pick up the other chopstick and place it on top, firmly between the tips of your thumb, index and middle fingers. The index and middle fingers should be curled. 4. When picking up food, straighten out the index finger as needed to move the top chopstick outward.